While It's easy to forget about potential flooding in the midst of enjoying another beautiful summer, it's incredibly important to stay prepared and ready at all times. Floods are unpredictable and, unlike a predicted hurricane, leave little time to prepare. Following a hurricane especially, flash flooding can occur suddenly due to rapidly rising waters in low lying areas after days of heavy rains. Floods are not only the most frequent natural and human caused disasters, they are also the most costly. And with the recent record flooding that wreaked havoc on Kauai’s North Shore in April of this year, and the hundreds of millions of dollars that have been estimated to repair the damages in residential, agricultural and commercial areas, it’s that much more evident that being prepared and informed in Hawai'i is incredibly crucial. 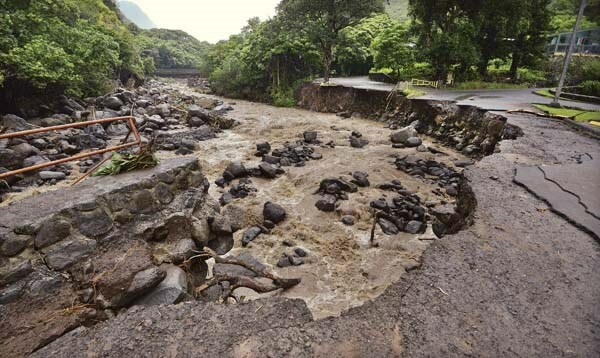 See below for a very helpful list from the Hawaii Emergency Management Agency on what to do before, during and following an unexpected flood. Reduce the risk of damage from flooding by elevating critical utilities, such as electrical panels, switches, sockets, wiring, appliances and heating systems. Turn off utilities. Disconnect electrical appliances and do not touch electrical equipment if you are wet or standing in water. Be aware that flash flooding can occur quickly and without warning so be prepared to move to higher ground and do not wait for instructions to do so. Secure your home and elevate essential items above potential water line. Turn off utilities. Disconnect electrical appliances. During a Flash Flood: Stay informed! Avoid contact with floodwaters which can be contaminated by gasoline or raw sewage. Floodwaters may also be electrically charged from downed power lines. Return home only when authorities have indicated it is safe to do so. Address damaged sewage systems as soon as possible due to serious health hazards attached to overflowing septic tanks, cesspools and leaching systems. Contact Premier Restoration Hawaii or another IICRC Certified professional water damage restoration company on your island to dry all affected areas that may have come in contact with the flood water as areas like drywall, carpet and flooring exposed to moisture may encounter mold growth after 72 hours of saturation.